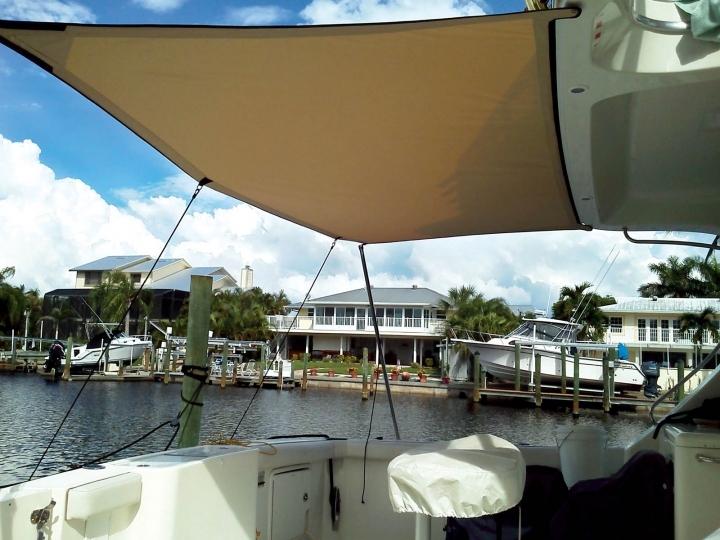 Boat sunshades are a simple but new addition to the various styles of marine canvas tops and covers available today. Primarily used on larger boats or yachts, boat sunshades typically extend to the aft of the boat from a radar arch or raised bridge. Sunshades can be attached to a boat with zipper or have a retractable system in place which is what is common with patio shades you see on homes. They are supported with either stainless steel or aluminum tubing with support straps to keep the canvas tight. 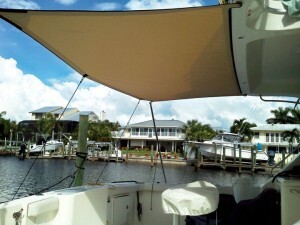 Keep in mind that boat sunshades are designed for exactly what they’re named for, keeping the sun shaded off your boat. They are not to be used in inclement weather to keep rain off the aft of your boat or yacht. The support structure of a sunshade is not designed for that whereas an aft cover or panel enclosure would be suited best for that job. The US Coast Guard reported in a 2012 survey that the average boater spends five and a half hours on the water per outing. Sun safety is an everyday concern for everyone but should be more important to the health of all boats. 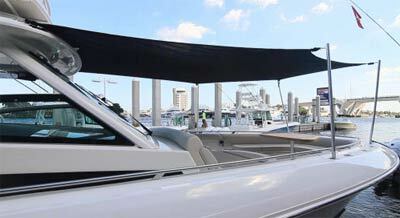 Sunshades allow boat owners to add shade to areas of their boat that is sometimes not possible. Advanced marine fabric manufactured today such as Sunbrella a UPF of 50+ which will significantly increase sun protection on your boat. Remember, 20 minutes of sun exposure is all it takes to get sunburn if you are not properly protected. For most, prime boating times typically correspond with the worst time for peak UV exposure which is mid-day. Boaters know the growing importance of sun protection and a sunshade is a great way to achieve that goal while on the water or at harbor. Sunshades provide great protection from the sun which is critical to your safety and life on the water.